I found myself a bit stuck in Calgary for much of the month of November. I needed to get both my driver’s license and passport renewed. But, of course, you need ID to do things like fly, and go to bars, so I couldn’t do both pieces of ID at the same time (since I also flew to Regina to be on the morning news). But, once I finally got everything sorted out in the city, I made sure I had time to head out to the Rockies to do some shooting. But, as you might know, I’m about 50% cheap, and 50% crazy. So, instead of making a week of it, I thought “I’ll bet I can shoot all my locations in Banff National Park in one single evening.” And that’s what I did. My goal for the Rockies on this visit home was to work on some night photography imagery. So, at 7pm I left Calgary for the mountains, and I would spend the next 12 hours driving, location hunting, and, of course, shooting in Banff National Park. In total, I tried to shoot 7 different locations on my trip. However, my two locations in Yoho National Park on the BC side of the border didn’t work out because there was just too much cloud cover. So, I actually just worked at 5. 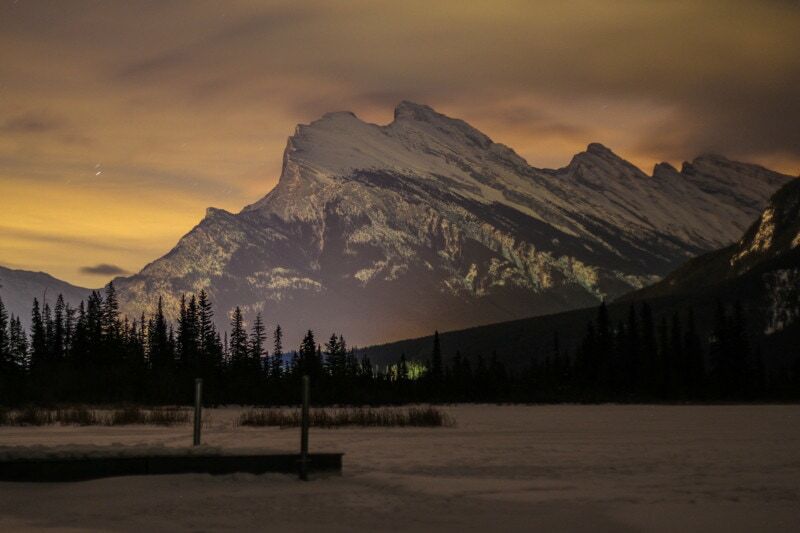 Rundle Mountain and the glow of light from Banff. 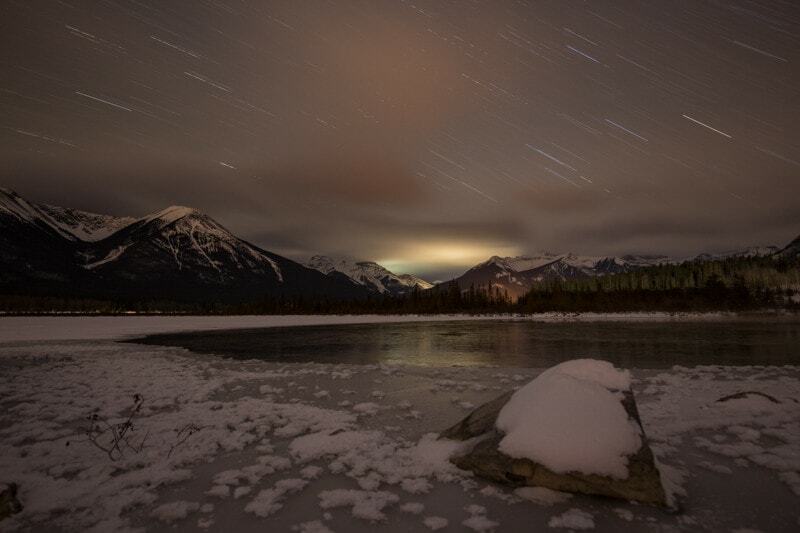 Vermillion Lakes and star trails. I had been envisioning a really specific shot for Castle Mountain from the old highway. I really wanted to capture a shot of the road itself, with the mountain as the backdrop. But, it was impossible. First of all, it was far too dark to see the mountains at night when I went looking, so finding my spot was tricky. Then, when I found the spot the road was quite narrow and icy, and I was worried about a car coming down the road too quick and not being able to avoid my car. And thirdly, my second worry was probably illegitimate because the 4 times I went up and down the Bow Valley Parkway, I didn’t see another car. I was hoping that a shot of the road and stars would also include the star trails of a vehicle. 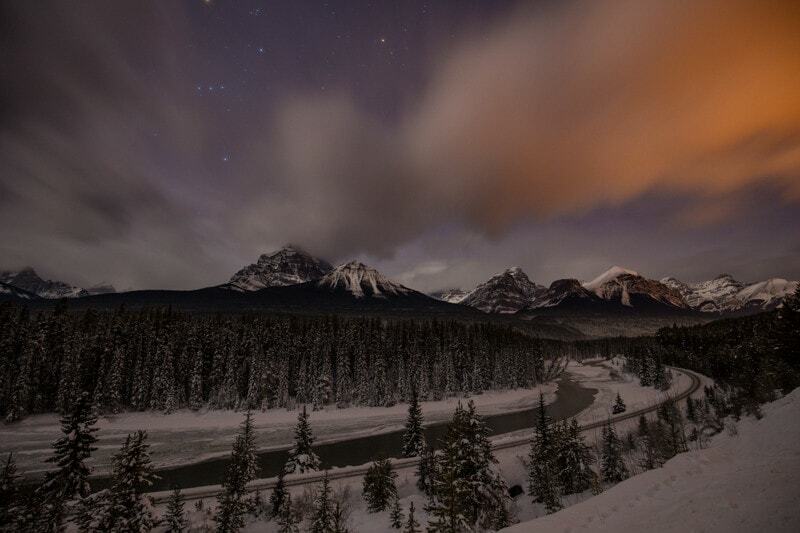 In the end, I settled for a spot along the bow river which actually worked really well. I shot short exposures and one star trail image. 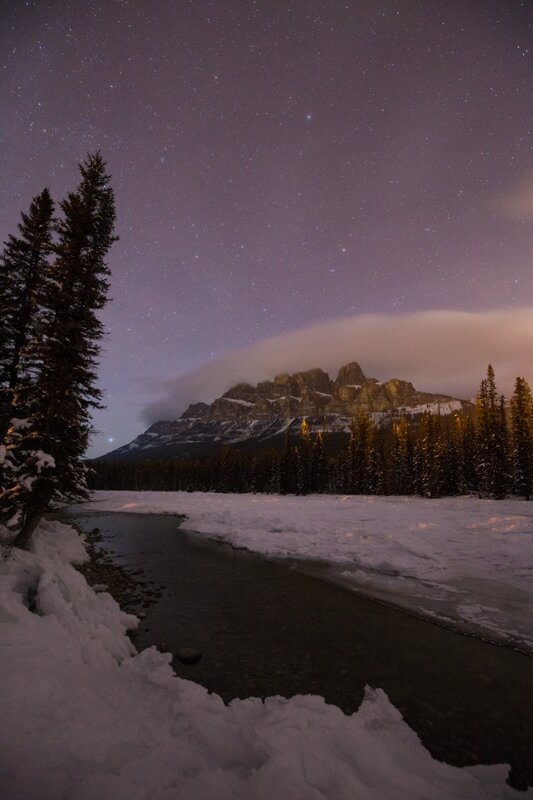 Castle Mountain over the Bow River. 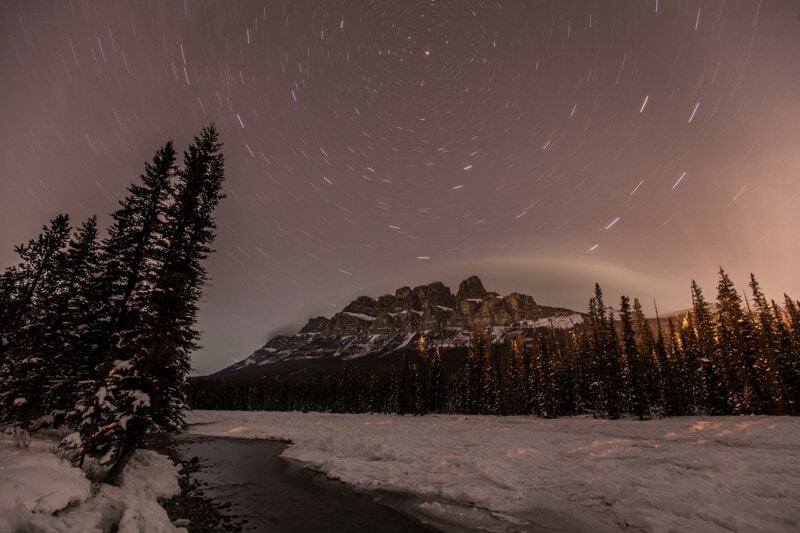 Star trails over Castle Mountain. This is a classic location, but something that really doesn’t get shot that much in the winter because the lake freezes over and the scene looks less impressive. To make things more challenging than usual, clouds rolled in when I was there. 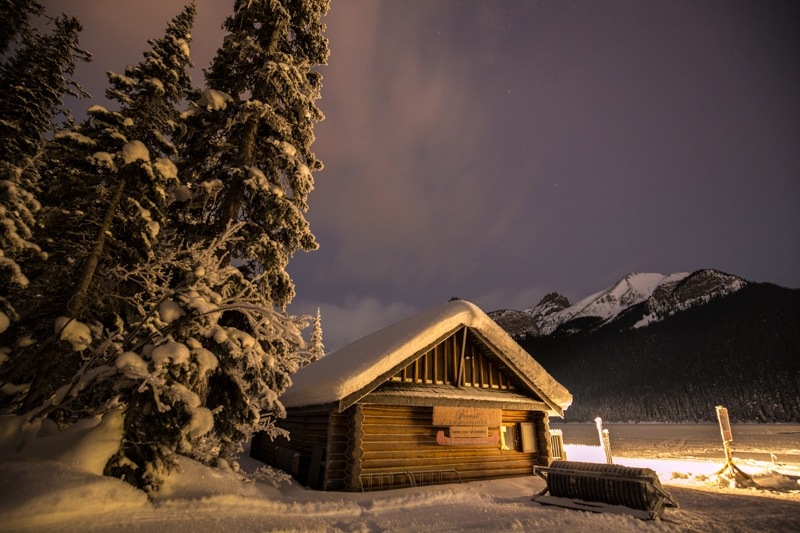 But, I still managed to use the old cabin on the lake – and all the fresh snow – to get some cool night shots that are fairly star-free. Then, just as I was about to leave the stars came back out again and I got decent images. I used the creek leaving the lake to add some water to some of my images as well. I think water is really important in night photography. I’ll talk about that more in a bit. The cabin at Lake Louise. 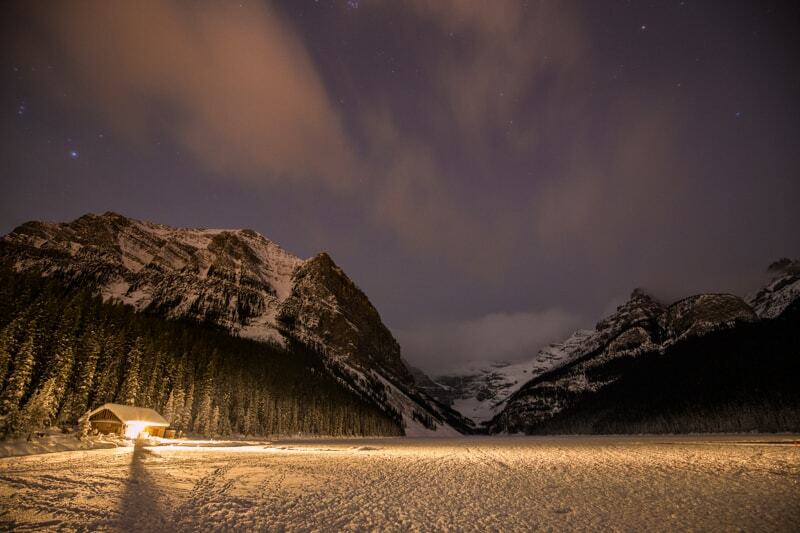 The frozen Lake Louise and the cabin. 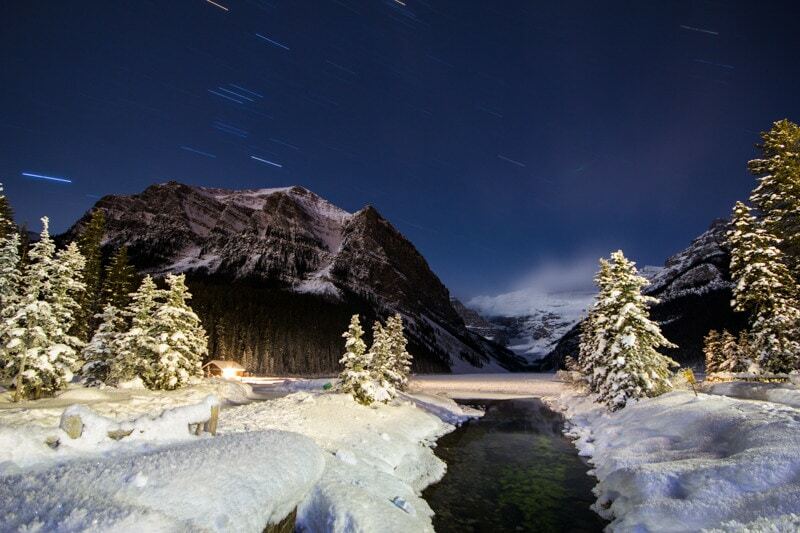 Star Trails over Lake Louise. 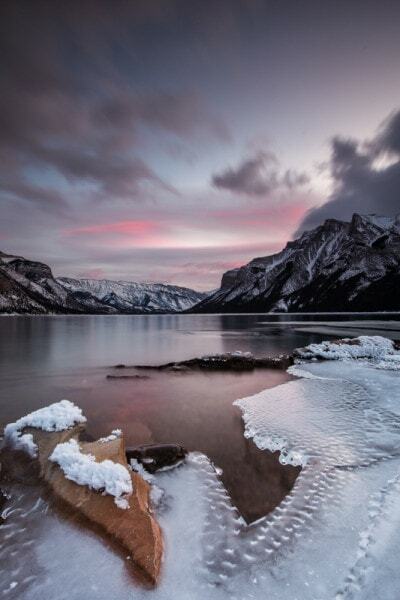 This is actually one of my favourite locations to shoot in Banff National Park. I love how dramatic the skies get here, and that classic view of the bed in the river and the railroad tracks is amazing. I was really hoping that a train would push past well I was shooting, but in an hour, not a single one went through. The skies from here were very cool. The moon came out and was giving the imagery a bit of a sunset-meets-stars look that I really liked. I didn’t plan on going to Lake Minnewanka, but when I busted at Yoho National Park I decided to check out Lake Minnewanka before going to Two Jack Lake. I’m glad I did. The icy scene along the open water on the edges of the lake made a really great anchor for the images, and the moon was having a cool effect on the clouds as well. In the morning, I also shot sunrise here. f/4, 30 seconds, ISO 1600. 2 images focus stacked. Loved the light the moon was causing. So dramatic. f/4, 30seconds, ISO1600. 2 images focus stacked. 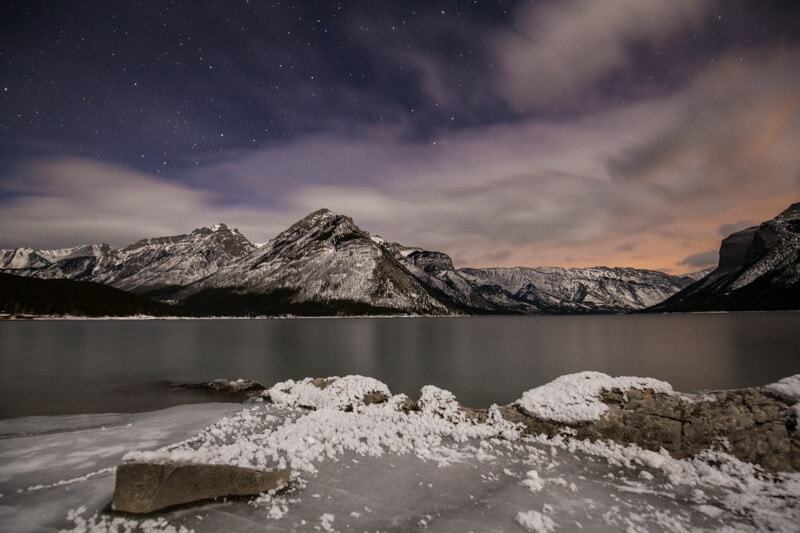 Just before Sunrise on Lake Minnewanka. 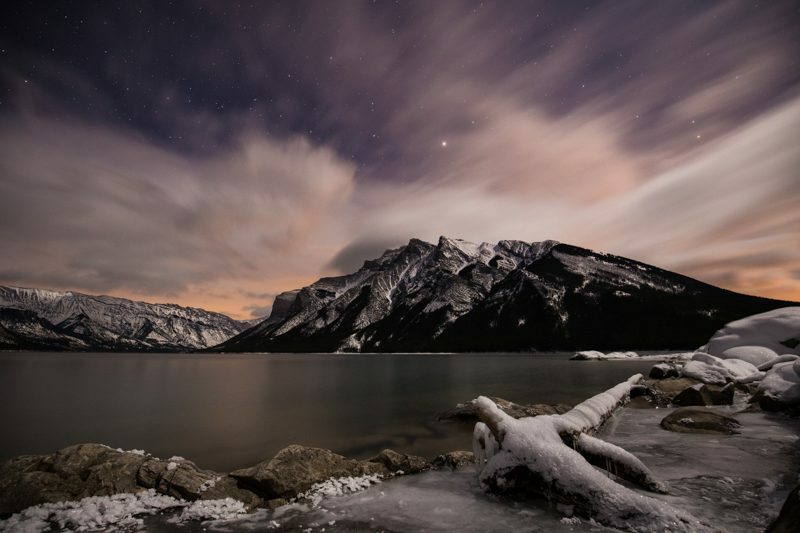 Night photography is very technical, and at first can feel quite overwhelming. Moreover, you’re often shooting photos of things your eyes can’t even see, so it’s a bit strange at first. But, like any type of photography it gets easier with practice. Traditionally, the idea is that you want cloud-free, dark skies and no light pollution. 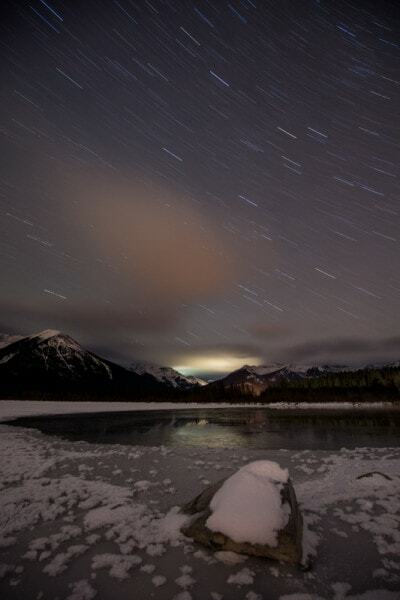 Places like Banff National Park and Jasper National Park are great for star-gazing. However, it can really depend on the location you’re shooting. 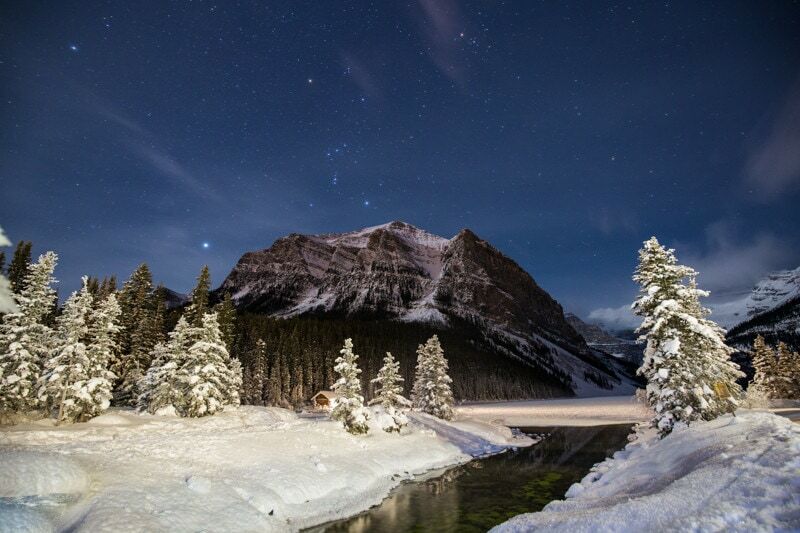 For example, if I’m shooting star photography of mountains, I want a light moon on the horizon. There, if I keep the moon at my back I can use it as a soft light to lighten up the mountains. If the moon is too full, it’ll be too bright and burn out the stars, but a new moon or something like it would work perfect. If I’m somewhere without mountains, I really prefer no moon at all as the stars shine brighter. And, if you have something you want to light up you can do it by light painting is a bit with a torch. The settings on your camera are going to be greatly affected by various factors. However, I find that a great starting point is f/2.8, 30 seconds, and ISO1600. You can make adjustments from there. Of course, if you only have f/4 like my wide angle lens does, you’ll need another stop of light, so f/4, 30 seconds, and ISO3200. Finding a focus is incredibly difficult in the night. If you’re focusing on something fairly close to you, use your torch to light up the object and then use the autofocus or manually focus it. If you’re focusing on the stars, I find the best thing to do is use the infinity mark on your lens. And, yes, I know everyone says “but your lens’ infinity mark isn’t 100% accurate. Well, it’s likely more accurate that my eye, and I’ve never come back home to see images shot at infinity to have out of focus stars. When you’re shooting wide open apertures like f/2.8 you can’t possibly get the right focus on the entire image if there’s something in the foreground of your image as well as the stars. Shooting 2 or 3 images and then stacking them together will fix this problem. I tend to just use two, one for my foreground element and one for my stars and mountains. So, in photoshop, I’ll layer one of those images on the other and then use the gradient tool to bring out both sharp images. I don’t want to get too detailed here, but if you have questions on focus stacking there are loads of youtube videos on how to do it. I’ll likely be creating one myself fairly soon. Two images focus stacked for a sharp foreground and background. This is something I mentioned in the video as a mistake I used to make a lot in night photography. I would shoot images, and then look at the LCD and they’d look fine. But, at night the LCD is so bright compared to the ambient light, and the images on it look more clear and brighter than they actually are. So, use your LCD for composition factors, but not exposure. If you want to make sure you have the exposure right, learn how to read a histogram, and check your histogram in the field to make sure your image is OK.
No matter what type of landscape photography you’re doing, having an anchor is important. An anchor is that element in your image that ties down the front of the photo. That anchor can be as simple as a rock in the water, a person laying in the snow, or a piece of ice on the banks of a lake. The whole image should look like it’s being tied down by this anchor, if that makes sense. For example, in this image that open bit of the cracked ice serves as the anchor. If I moved a step to my left, that rock would have been the anchor. I find water so important in night photography. It gives the image a foreground element and adds some reflection to the photo. 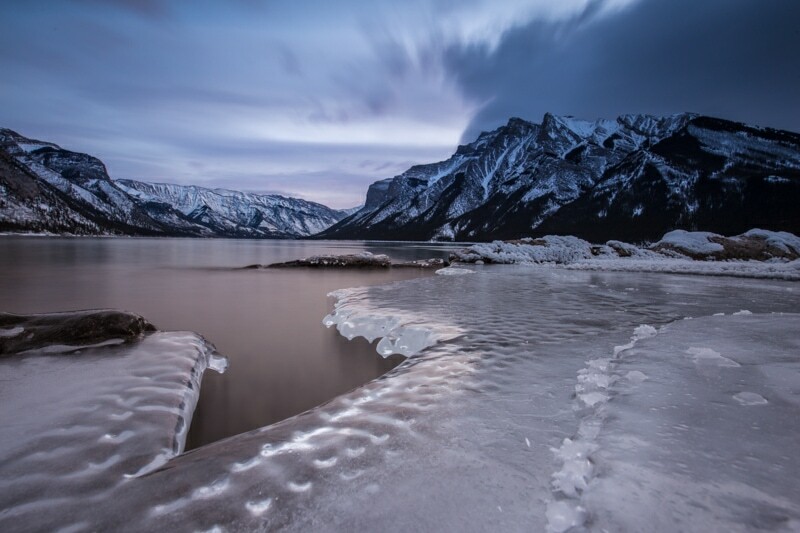 It’s not always necessary, but finding water rather than just shooting over a frozen lake or snowy field can really add that extra layer to your photo. Water is so important. It just adds that extra element. Can’t get reflections like this off of snow. I’m off to Europe! My first assignment over the Atlantic is a project with Viking River Cruises up the Danube River from Passau, Germany to Budapest, Hungary. After that, there are loads of other European adventures coming up. And, don’t forget that my travel photography workshop in Morocco is in February. We still have a couple spaces open, so if you’re interested, check out the info here. The colors in the images are so mean and thanks for sharing these fantastic pics. Amazing photos! I cant belive my eyes. Please can u link your camera and tripod please? I agree your photos are very nice. Cannon have best cameras. But I think more important is good lens than good tripod. So I think you have amazing lens to. Camera without lens is not good choice. How long you make photos? 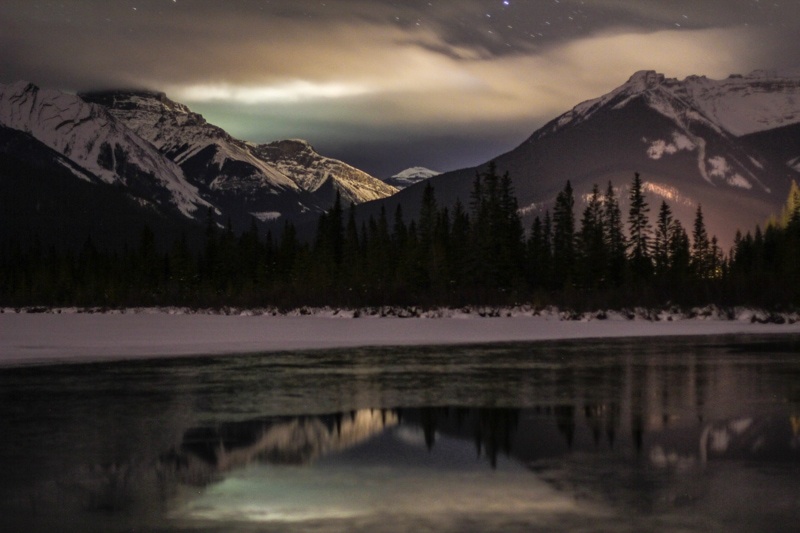 Now only 3 weeks away from a trip back to the Rockies and hoping this time to try my hand at some night time photography. I have taken the opportunity therefore to research your previous vlogs on this subject and also found this blog which, as always, has been so useful. Hope to be able to put this into practice soon.